ProbioFerm is a unique private label manufacturing company that not only specializes in contract fermentation and the wholesale of probiotic bacteria, but also has the capabilities to manufacture and package custom finished products. 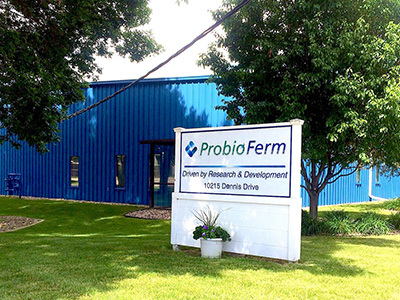 With our in-house expertise and specialized equipment, ProbioFerm has the ability to grow most probiotic and forage preservation bacteria and provide our customers with a multitude of finished goods packaging options. Our goal at ProbioFerm is to provide the highest quality probiotic products to our customers. As an essential advantage to benefit our customers, we control production, manufacturing, packaging, and quality all under one roof. ProbioFerm’s Quality Assurance/Control laboratory monitors all aspects of in-house production and new product development. Our Quality Assurance lab has over 20 years of developmental and research experience in the probiotic industry. By having our own in-house laboratory, ProbioFerm is unique in assuring the validation of all processes. ProbioFerm’s team is composed of experienced professionals whose primary concern is to give our customers the best quality probiotic products. We specialize in contract fermentation and can provide bulk cultures of various strains of bacteria. Our experience in partnering with customers to develop and produce private label finished goods. We utilize the highest quality ingredients for your products. With quality control over all processes, ProbioFerm can provide the highest quality cultures and finished products. Saving time and money – our internal laboratory and quality assurance programs allow us to control costs and provide our customers with stable and reliable microbial products. Worldwide access – we can ship directly to the customer or the end user, including international destinations. A Certificate of Analysis is provided with all microbial products. In 2017, ProbioFerm received the award for Most Innovative Company during DMACC’s Small Business Awards ceremony. ProbioFerm excels in probiotic fermentation and continually evolves with new technology, research, and product development. ProbioFerm is a biotechnology company located in Des Moines, Iowa. We are a high quality Probiotic contract manufacturer for all your needs. THE PROBIOFERM TEAM Meet our Team of Specialists.